-We were able to reuse everything from the prior one. Curtains and hardware, furniture, rugs, etc. Nothing was wasted. -The familiarity and connection had already been established, allowing us to move rather quickly. -The house, built in 1928, has the most amazing architecture, bones and timeless details. As this home was previously published in the Washington Post and, featured also on Cote de Texas, I'd like to share some new photos I took recently. Enjoy this lovely home from my perspective. Hinson's aqua-blue seagrass wallpaper in the library. Notice the tall floor-to-ceiling windows and French doors. Antique French slipper chair is upholstered in Bennison's Christmas Roses. The antique bench with nailhead trim is from Belgium. A George Smith sofa in chocolate mohair velvet gives the room a luxurious, masculine touch, and the wool carpet with its trellis design hints at the garden just beyond the French doors. I converted an antique marble urn into a lamp. It sits on a Swedish pedestal table from Tone on Tone. Pair of original windows with leaded diamond pattern in the renovated kitchen. 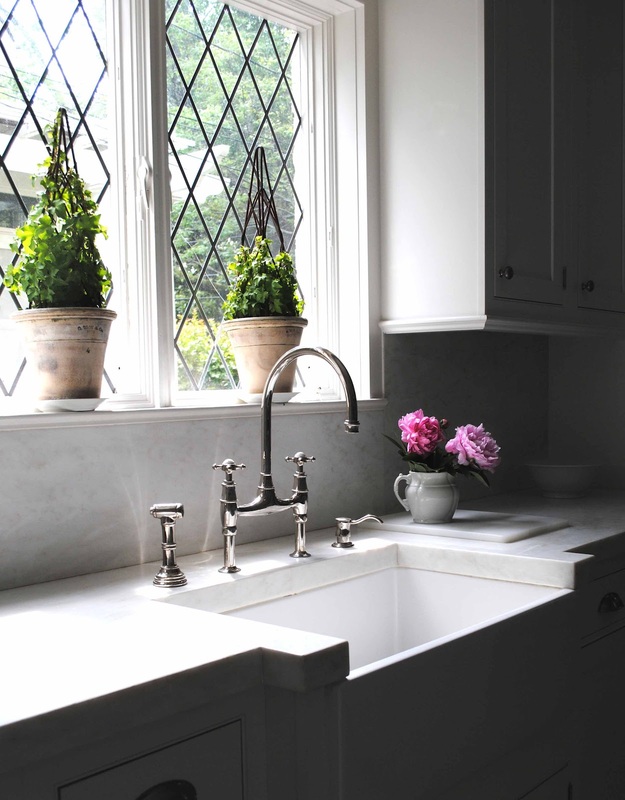 Linda chose a classic look for the kitchen with white cabinetry accented with a farm sink and graceful gooseneck faucet. 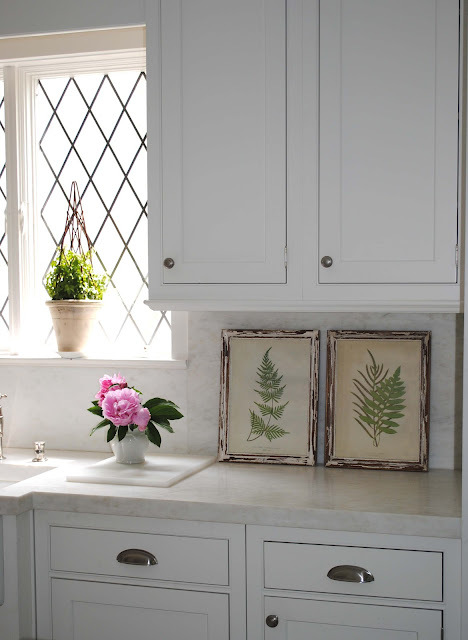 Notice the extra thick marble counter tops, which are very popular today. We painted the kitchen floors in a checkerboard tone-on-tone gray. Peonies from the cutting garden. One of my favorite architectural elements in the house is the living room's stunning limestone mantel with a tapered chimney breast (not shown). It looks especially handsome with the English polished steel fixtures from the 19th century. The French Napoleon III clubchairs I found in Paris. Pillow fabric is Shalmaz from Sheila Coombes. 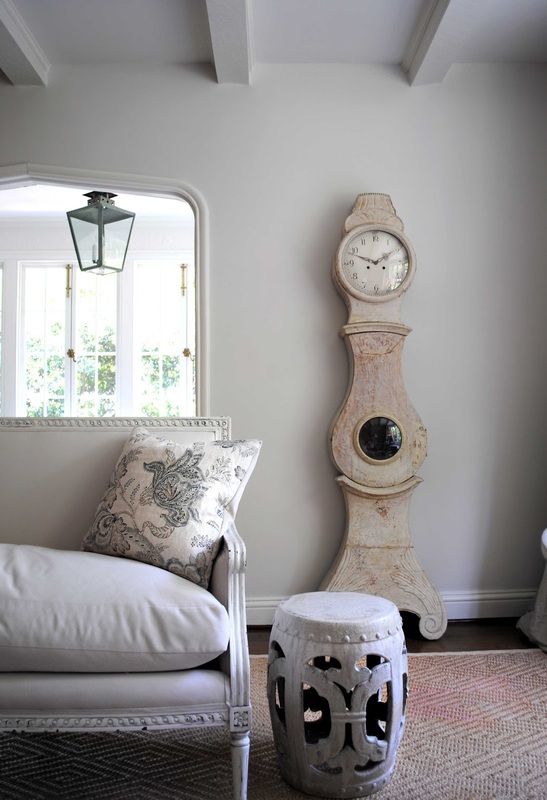 ABOVE: A sculptural Swedish Mora clock in the living room with beamed ceiling, arched doorway and French doors. BELOW: The sunroom is very Swedish inspired with its antique Gustavian settee and Rococo tea table, both from Tone on Tone. There is new radiant heating under the limestone tiles, which are laid in the Versailles pattern. I adore the window's period brass hardware - so charming! Antique French armchair / fauteuil in Chelsea Textiles small checks. 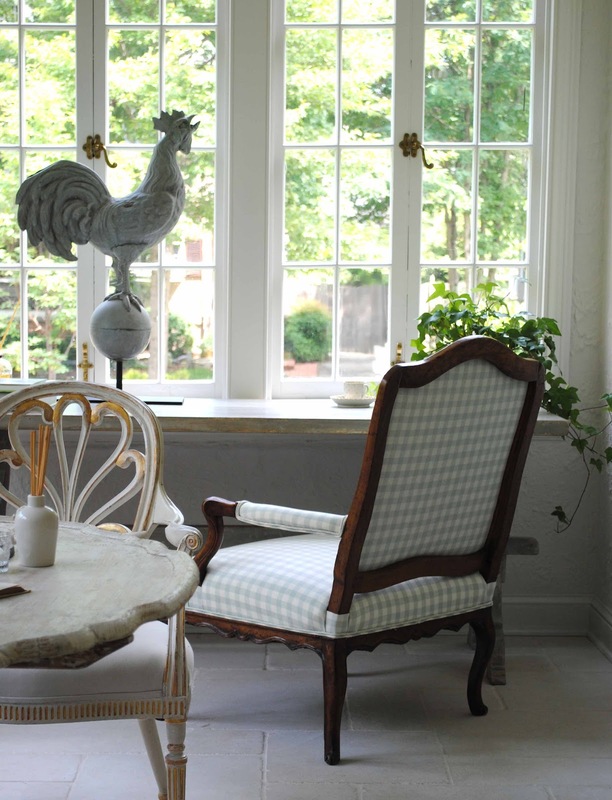 The zinc rooster weathervane came from the family home. An original forged and wrought iron gate. I suggested a boxwood and gravel side garden when grass wouldn't grow there. The landscape was designed by the late Michael Bartlett, a renowned landscape architect. There are numerous boxwood, trained ivy columns, climbing roses, peonies, hydrangeas, and stately old trees. I hope you've enjoyed seeing more photos of this beautiful, timeless home. A very special thanks to Linda! 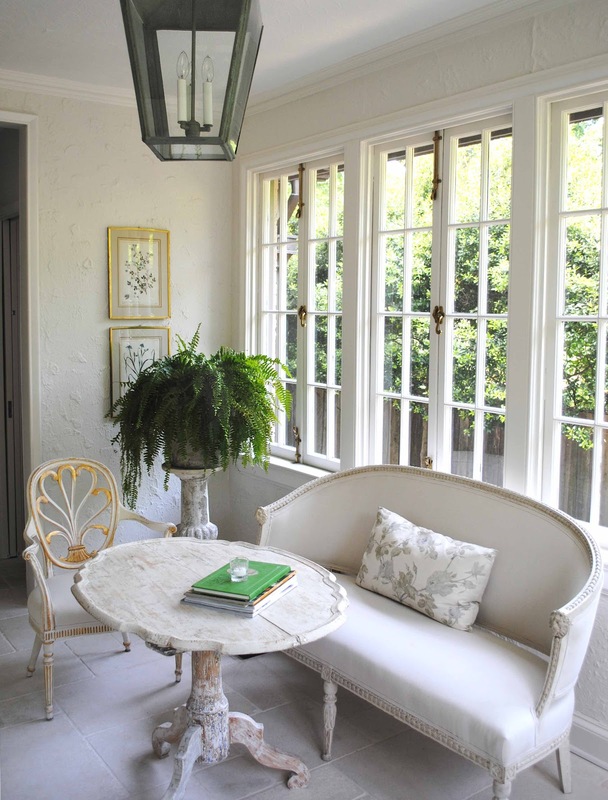 The blue seagrass walls, the tone on tone painted floor, that sunroom and the boxwood lined pathway....so lovely. Stunning. I've followed the story on both of these houses and they've both been simply stunning. If only... 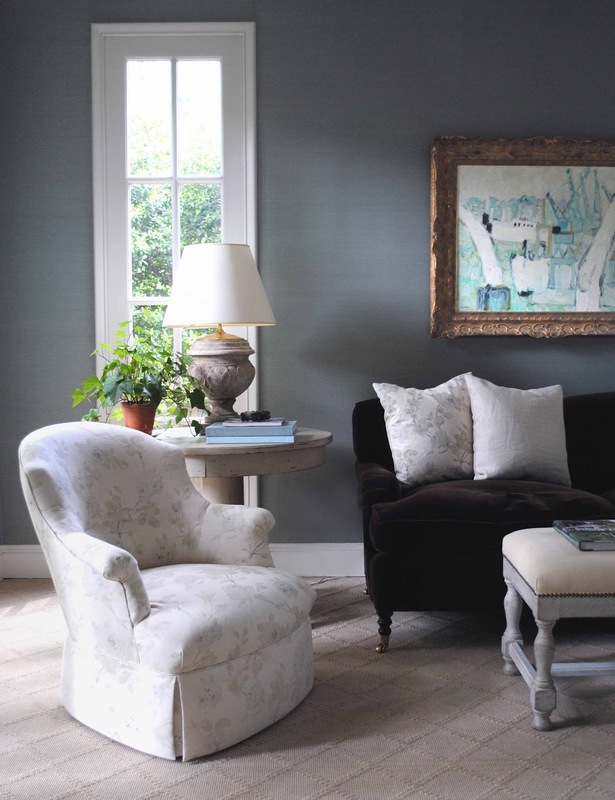 Anyway, I've totally decided to revamp my own home and slowly, but surely, get back to a "tone on tone" style I first fell in love with through Tricia Foley's interiors back in the 90s. The Swedish Style you do, Loi, make it so fresh and elegant. It's truly a timeless look. I've become completely smitten. Thank you for posting these new pictures and giving more details. Beautiful. Every single room. Every detail. I could start naming everything I love but what's the use, I love everything! Thanks for sharing your art with us, Loi! Oh my goodness, Loi! This home is amazing. I love the mantle, the weathervane, and oh the check fabric just finished it! In fact, there is not one thing I didn't love. I want the sofa too. And then to finish the quaint, beautiful exterior and lawn. Perfection. Thank you for sharing this lovely home. I can just imagine sitting very comfortably on that George Smith velvet sofa no less, flicking through the latest copy of 'House and Garden'. Then I would waft to the sun room and have a cup of Earl Grey tea. I might even go and inspect my invitations perched on that stupendous mantlepiece. I would of course be in heaven. Loi it is all sublime. Loi this home and your touch is flawless - just stunning! I'm the same as Kifus, I love everything! What I really love about the homes you design is that they have character, a soul. This home looks so comfortable and inviting and well, homely as well as being beautifully designed. As I've got kitchens in my head at the moment, my own needs a makeover, I'm particularly drawn to your style. The marble, your 'tone on tone' colours combine to make such a soothing palette and I ADORE that checkerboard floor. I am seriously inspired to do my own kitchen like this. Thank you for sharing this lovely home. The library is my favorite here. It seems that everything is balanced and there is interest, nothing one note. The chocolate mohair velvet sofa is calling my name. Hi Loi - How nice to see another perspective of this beautiful home! 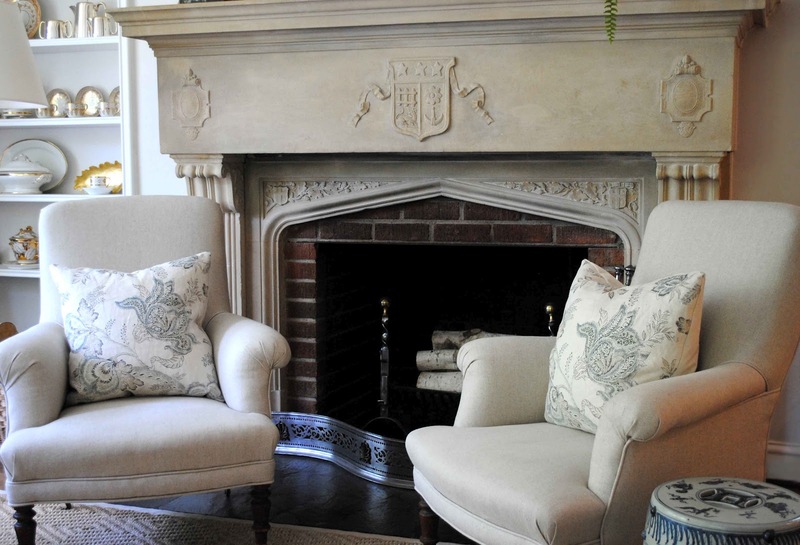 Love the Bennison fabrics you and the homeowner chose, along with everything else! It's a lovely home and thanks to you and the owner for sharing more photos. Have a great weekend! Oh my goodness...such a lovely and elegant home and gardens. My favorite touch is the blue grass wall treatment...but each element really speaks to me. I love her kitchen too...that gray checkerboard floor is fabulous. The Swedish furniture is beautiful...You are very, very talented! Loi you and Linda did a wonderful job on the house. Would you mind going back for the urn lamp you made it was the first thing that caught my eye and I love it. The side boxwood garden is wondeful something I'm putting in where it gets little light. All so beautiful you have a wonderful eye! Your clients are so lucky to have you to advise them. This house is wonderful.I do love the Swedish style. Could you just pop over here and sort our house out! As usual, I'm drawn to the garden-and love the simplicity of an all green/box garden. May I ask what trees you planted along side the box? Liz - Those are foster hollies, limbed up. They were planted by Michael Bartlett, the garden designer. Those are actually controls / toe switches to turn water on / off (in case your hands are dirty). Linda found those. I feel like I just got back from a few hours at a spa. The colors you work with are so calming and comforting. What a beautiful home both inside and out. Thanks again for sharing your incredible talent. Oh my..this is incredible. I love everything. Love that pop of live green in those amazing windows! And that garden path darn near made me faint! Loi, is the mantle original to the house? I love it. And those leaded windows are gorgeous. You did a wonderful job accentuating the homes beauty! Thanks, Ann! The mantle is original....you should see it in person....incredible! I fell in love with this house when Joni wrote about it, Loi. And now, seeing these photos, the gardens included... sigh! There's absolutely nothing I don't love about it. BTW - The kitchen is beautiful. I'm so glad she kept the diamond leaded windows. I loved this home when I first read about it on cote de Texas! I've been your fan ever since! Thanks for sharing more photos of the beautiful home! What a wonderful modern way to decorate in the Swedish style. Every detail of the home was just classy. I loved how the mora clock behind the sofa was in a different color tone. It seemed as though it had a bit of an orange, pale flesh color tones against gray. The choices in furniture really make this house special. The check painted floor was just terrific! The choices in color were right on! This home is amazing. I was blown away by the interiors, and then again by the exterior! Thank you for sharing all the beauty! I wished we lived closer! You would be such a great help with decorating the homes of my clients (and mine!). You have don a wonderful job! I loooooooooooooooooove it! Congratulations! Your client must be 'in heaven' with the home decorated by you!! As usual your stylings do not miss a beat! Beautiful flow and balance throughout. Wonderful textures and colours. The floor in the kitchen is charming, "just right", and your suggestions for the pathway... perfect! I like the recurring diamond motif flooring from the painted floor in the kitchen to the CG Coe & son Carpet in the library. I could huddle up with a good book on that Sofa in the library and not move all day long. What a wonderful way to guide a client to a smooth transition from one home to another. I really enjoy all your attention to details for the delicate "care and idea feeding" in Linda's home. Especially marrying interiors with exteriors it takes patience and speed to orchestrate. To consider the whole picture: history of architecture, furniture, landscaping, colors, textures, light and client sensitivities is a wheel and only with balance will it totally please us. You achieve this every time and as a designer...what a dream come true! Thanks for sharing your work and clients home with us. I thoroughly enjoyed this post. Beautiful. The house just seems 'happy'. You were lucky to have some charm already built in, but all of your design choices are the perfect compliment. There are so many things to love here, I like many others,love the painted checkerboard floor. Genius!! The kitchen was calling out for that. I also love how you seemed to be sensitive to your client, by not suggesting that she just throw everything out and start over. But to carry the things she loved to her NEW home, brings such a sense of continuity and peace. Well done, Loi. I am the very happy owner of this beautiful project of Loi's. If I could pick all the peonies and hydrangas in my garden and have them delivered to Loi, I would. He is not only extremely talented - looking at things in a way no on else does - but he is also very funny and very clever. I love visiting his store on Saturday's and just hanging out and talking and looking at his beautiful things. If you aren't in Washington DC area and cannot visit the store - go to his website - I honestly believe there is no store in New York, LA or anywhere else which carries as beauatiful and unique furniture and furnishings. 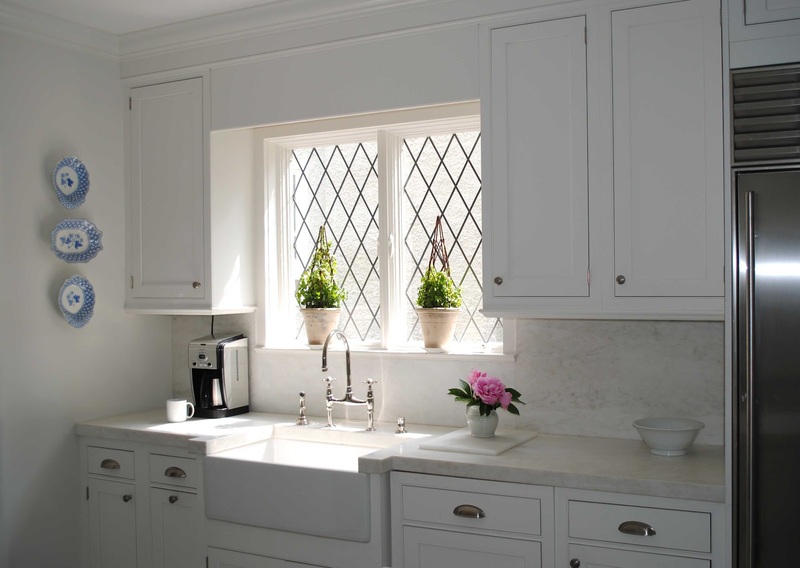 I love the lead glass windows in the kitchen and the painted floors are wonderful. Of course I love the Mora clock, and the gardens as well. Beautiful! Everything is just beautiful. Because things were so well selected the first time you were able to use everything again. Well done, Loi. Looks like you have a very happy client! I love the fabric on the pillows on the chairs - do you know what it is? I must email you soon - it has been a crazy week and my computer went on the fritz so I have been at the apple store twice this week. Ugh! Hope you are well. It is a long weekend here with Victoria Day on Monday - do you have a holiday in the US this weekend? Oh, and those limestone tiles and the boxwood and gravel path - lovely! I am a major boxwood lover but cannot get it to grow here (I think I complained of this here before). I enjoyed reading about the two houses when Joni wrote about them, and I appreciate seeing additional pictures of the new house. Your work is exquisite. Dear Loi - how lovely to find your sweet message over at The Hedge today! I'm an avid stalker of your fantastic Pinterest boards, & yes I need to get my Pinterest act together & pin more frequently, message noted. I so enjoyed Brooke's post on her visit with Steve & the kids to your DC home recently, you are kindred spirits you two. Washington & Boston are my favourite places to visit in the Excited States, having made numerous trips to both cities over the years for work. I think somewhere in Tyson's Corner there's a plaque acknowledging my 'interest' in their Centre - I do love to shop! O M G Loi, your post is amazing. 1. Your photographs are truly professional, and outstanding. 2. Your decorating talents are so enviable and your taste is undeniable one of the best Ive seen.3. That home is so beautiful, and you're right, the "bones" and architectural details are so grand! What a pleasure it must have been to work with Linda on that house. Her furnishings are spectacular! 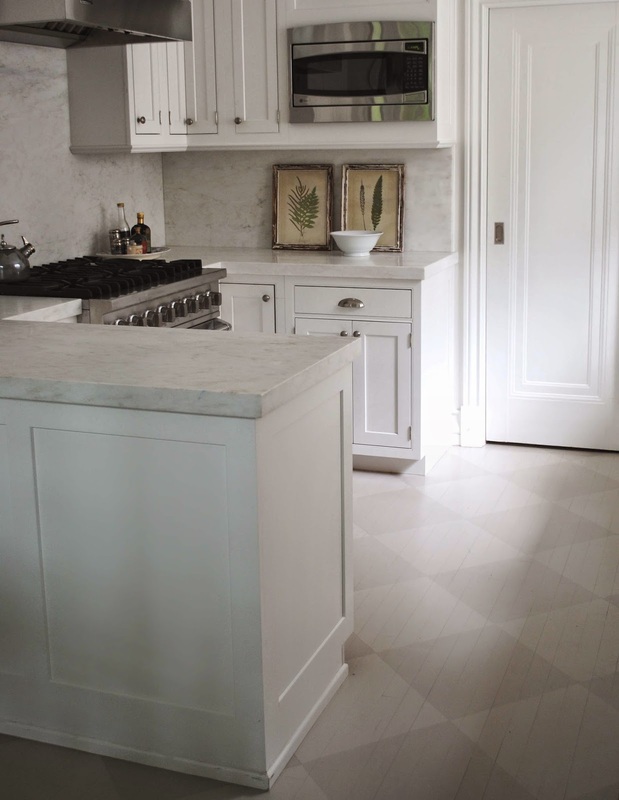 Love the kitchen, the painted floor--all of it. It is a pleasure to know you my friend, have a lovely weekend. Great job. I particularly love the room with the tile floors, and the fact that you could use so much of what she already had. Outside of the house seems a bit "English tudor-y," or am I just stuck in that phase. What a great job you've done on a wonderful house. 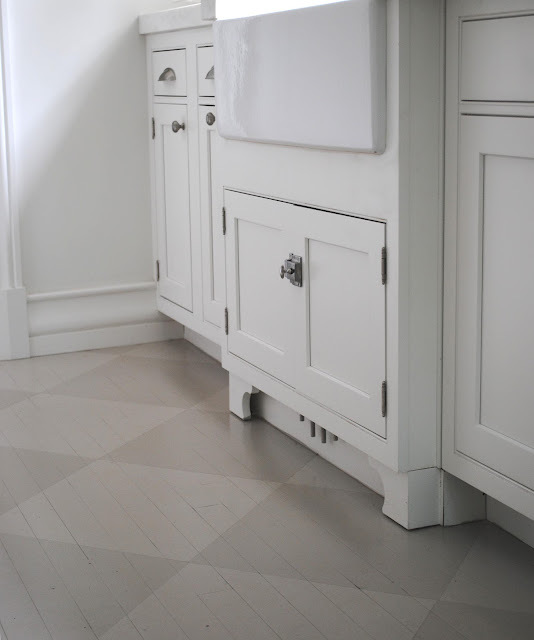 I particularly love the kitchen floor; beautiful. I don't even know where to start! I love everything about this gorgeous home! It has really spoke to me this morning! I had been looking at doing a blue seagrass in my new entry and after seeing this...it's a must! Thank you, thank you for sharing you pictures with us and allowing a glimpse into this home and yet another fabulous Loi design! Hi Loi, this home is beautiful!!! I love that you reused everything too. You're amazing! Thanks again for sharing. Loi!!!! Now this makes me proud to be Swedish! 5 stars! LOVE the windows and the floors in the kitchen. And the Swedish floor clock is to die for. I am going to Stockholm this summer. Let me know if you are going over on a shopping trip! I know a lot of the antique dealers. P.S Added you to my blog roll. Beautiful home and beautiful decoration for it! Great job Loi. No wonder your client trusted you on her house again! Breathtaking! LOVE, the kitchen floor and the mantle especially! But the colours here are just SO serene and perfect - and the boxwood and gravel side garden - just stunning! Loi - you KNOW that I love your style - I could quite happily transport every element that you design into my own home. I don't think that I've seen ANYTHING yet that I wouldn't love for myself - and that includes your dogs! Wow, Loi, I love every inch of this amazing home. The kitchen with the farmhouse sink and marble is amazing and the mantle - I can't quit staring. Add a garden gate and pebbled path and I'm sold...stunning!! Loi, such a pretty home the two of you created and everything reused from the previous home! I think this is so much more creative and impressive when this is done. 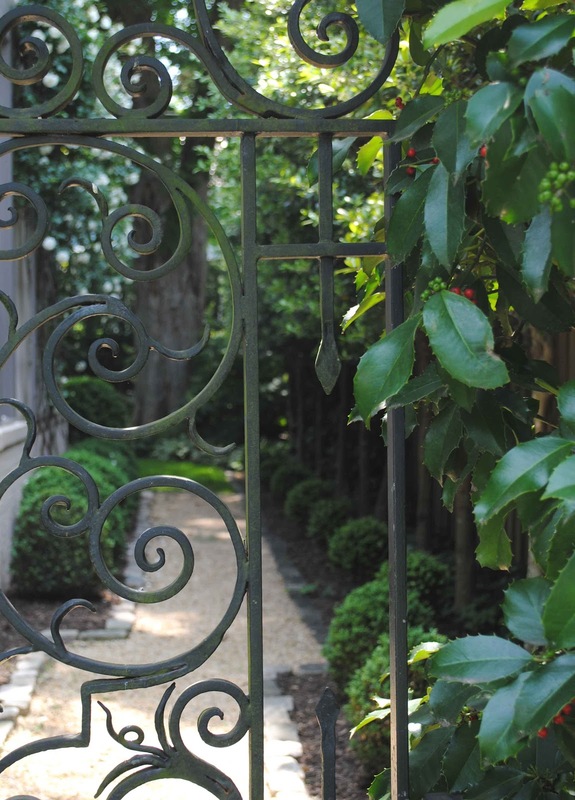 The entire home is full of lovely details and such a perfect use of boxwoods in the gardens. Well done! As everything you do is! What are type are the trees adjacent to the gravel path planed next to the fence? I read the Post article and Joni's beautiful post as well. What a lovely, restful home. You did a magnificent job. I just had another stare at the kitchen....dang I want it so badly. 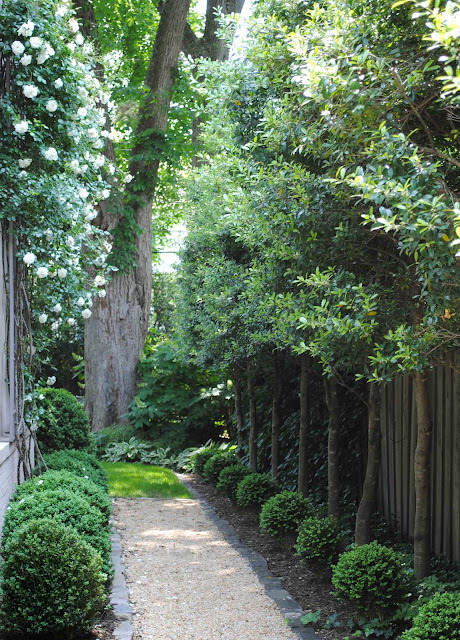 The side yard is the perfect inspiration for ours... Thank ou so much!!! This certainly is a very beautiful house and garden. Your photos are inspiring. The picture of the side garden has inspired me to redesign my own side garden. Do you know what trees are lining the fence? They add perfect structure. Thank you for sharing this amazing home with us. Wow, This is awesome. Swedish style was so fabulous and elegant. All of the features looks precious and really amazing. I like it and hope someday I could afford to have a Swedish style home . Big thanks. Loi, I love it all and keep coming back to your photos for inspiration! I am ready to paint the (previously painted) wood floor in my farm house bathroom and would love to know the colors you used on the kitchen floor. Thank you so much for sharing your photos and being so generous with your sources. This is my favorite home! 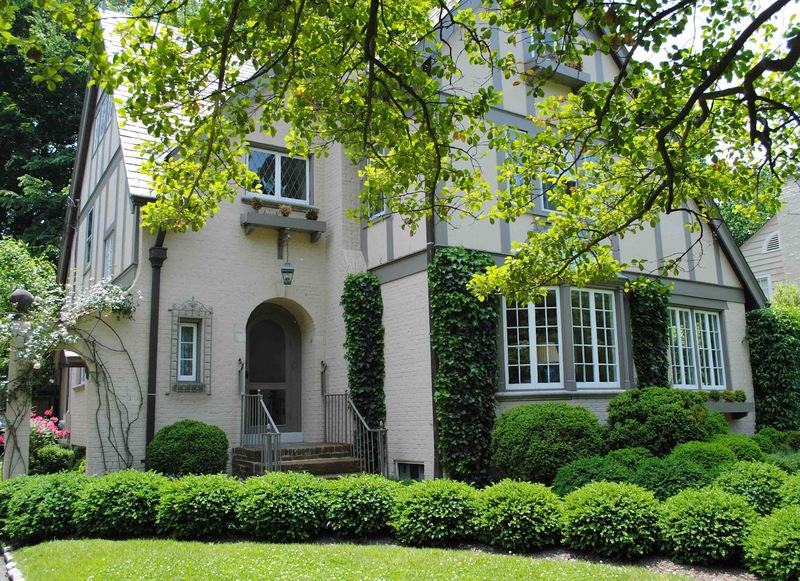 Do you happen to know the exterior colors on Linda's tudor? What is the tree in the side yard, that is 'pleached'? Love the trunk. Around the Garden and a New Shipment!